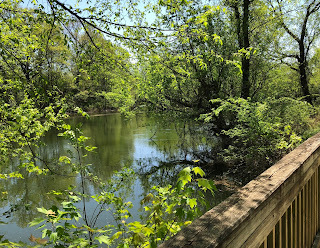 During my recent trip to Nashville, we took a walk on the Greenway. 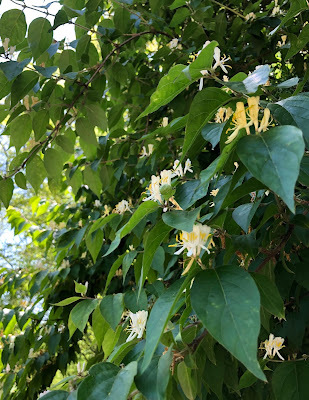 I saw some beautiful honeysuckle, so I took a picture. When I got home, I cropped the photo to get this composition. This is Shelli, a codfish cutout that I am decorating. Some 50 area artists are decorating these cutouts, to be auctioned in Marblehead Festival of Art's fundraiser. This year, my fish will be decorated with a seashell pattern where you would expect to see scales. 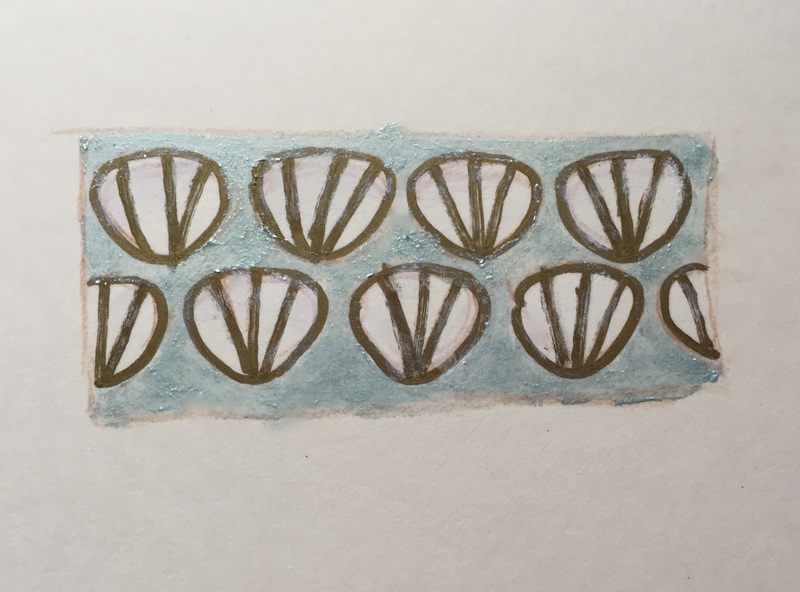 Today I kept going with round two of painting the shells, making the gold lines thinner and the white areas larger. So far I have 10 rows done. It is slow going, but worth it because it looks better. There will still be lots of mistakes to fix, plus I need to do a second coat of the background. To be continued. . . .
Today I kept going with this project, a wooden codfish cutout that I am decorating for the Marblehead Festival of the Arts. Area artists are decorating these codfish cutouts, which will be shown and then auctioned off online. This year, I am decorating my codfish with a pattern of seashell. Today I continued working on my second round of painting the seashells, using white paint and gold metallic fine-line marker. So far, I am eight rows in. But I am making progress. There are still mistakes that I want to fix, and I also need another round on the iridescent blue background. To be continued. . . .
Like some 50 local artists, I am busy decorating a wooden cutout of a codfish. This is a fundraiser for Marblehead Festival of Art. All of the decorated codfish will be shown in Marblehead and then auctioned online. This year, my codfish will be decorated with a surface design of seashells, taking the place of fish scales. You can see the whole design (still in progress) posted here Apr. 24. 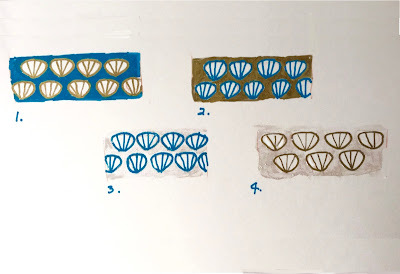 Yesterday I made the first pass at applying gold lines on the seashells. But I decided that the overall effect was too dark; I wanted the gold lines to be thinner so there would be more white area. So I am repainting the shells, which is slow going. They are pretty small. I think I reworked six rows today. Here are the first four rows I repainted. There are still mistakes to fix, but I already like it much better. To be continued. . . . Here is my codfish project as of this morning. Along with some 50 area artists, I am decorating a wooden codfish cutout that will be displayed and then auctioned to benefit Marblehead Festival of the Arts. 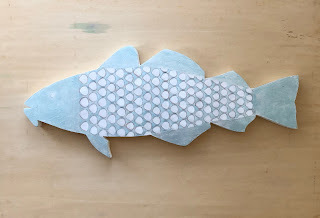 This year, I am decorating my fish with a seashell pattern, which is why I named her "Shelli." 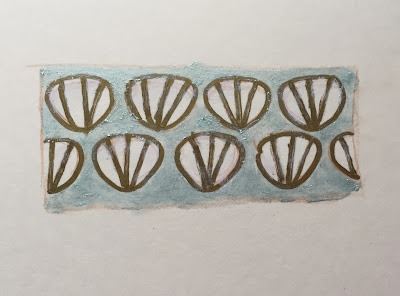 Today I worked on the seashells, and added the gold ink. I consider this a first pass. First of all, there are lots of mistakes to fix. Also, after taking this photo, I decided I want the overall look of the shells to be lighter, so I going to go over the shells again and make the gold lines narrower and the white areas broader. This will mean a smaller brush and a smaller gold pen, both of which I bought today. To be continued. . . . This is a closeup of Shelli, my current project. I am decorating a wooden codfish form furnished by the Marblehead Festival of the Arts. 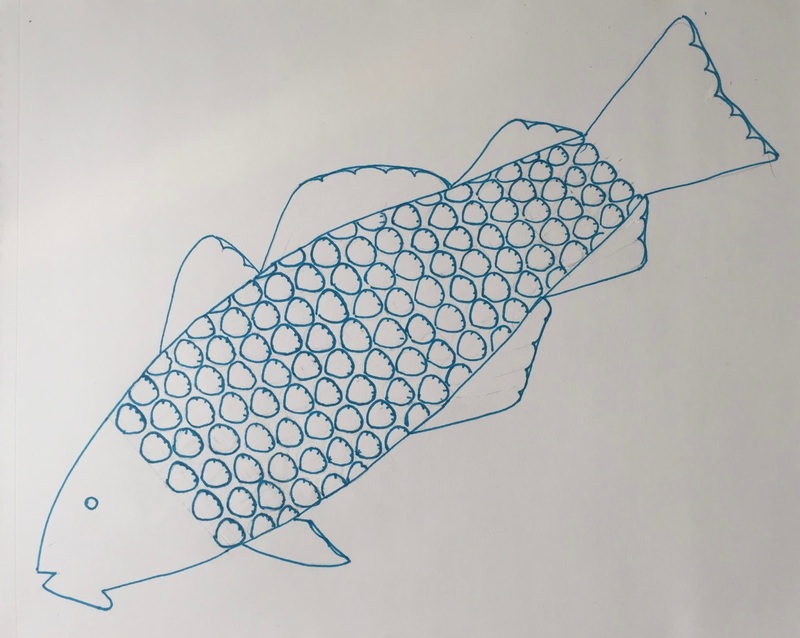 Some 50 local artists are also creating decorated codfish which will be exhibited and then auctioned (online). I call my codfish "Shelli" because of her seashell pattern. Today I finally began to apply gold metallic ink to the shells. I only had time to make a beginning, but I took a closeup that shows how it looks. 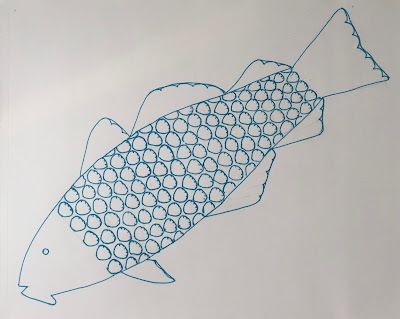 To be continued. . . .
Today I kept going with my decorated codfish. This is a project for Marblehead Festival of Arts. 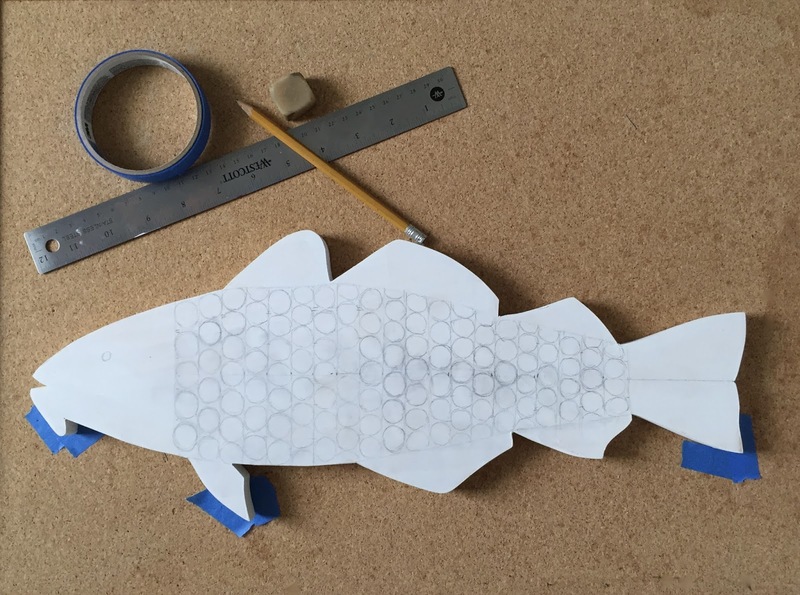 Some 50 local artists are painting a wooden codfish cutout for a show and online auction. 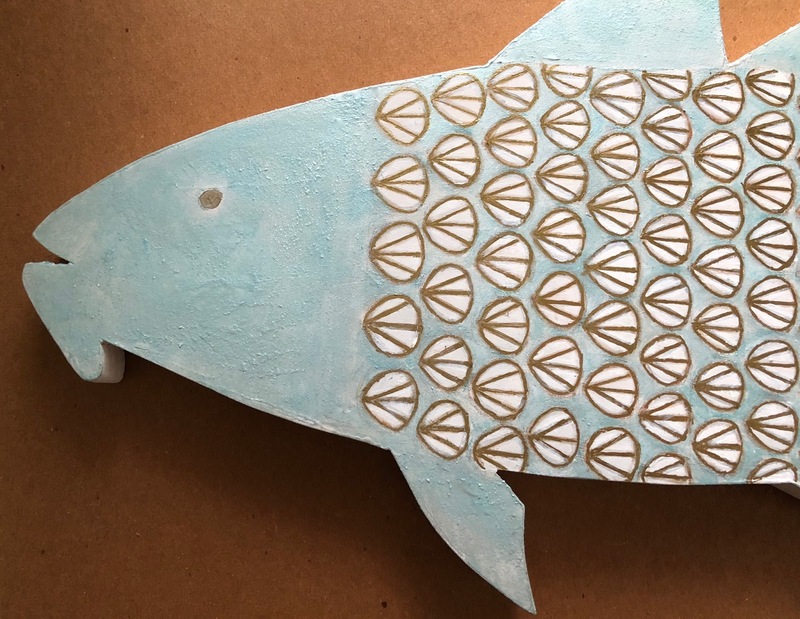 This year, I am decorating my fish with a surface pattern design of seashells, which is why I call her "Shelli". Today I went over the turquoise iridescent paint and then used colored pencil to draw three lines on each shell. I am going to go over those lines with gold metallic ink. To be continued. . . 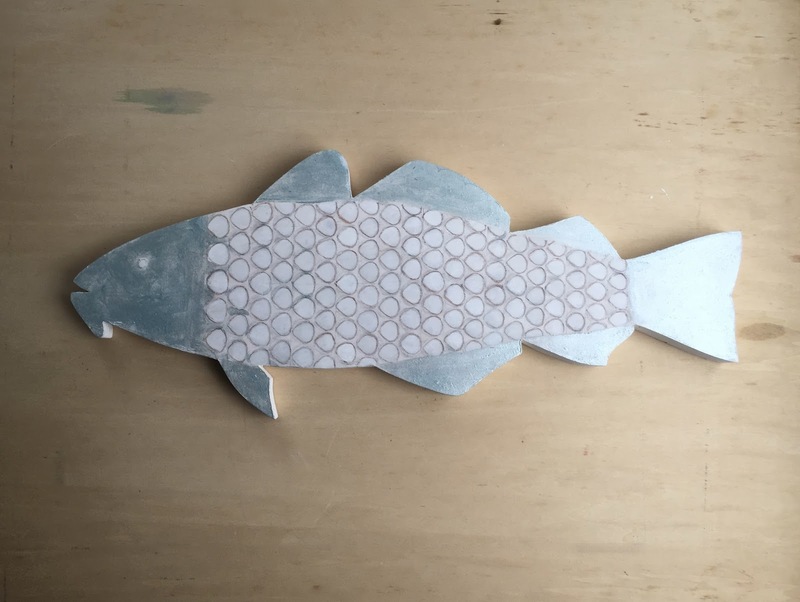 This is Shelli, my codfish project. 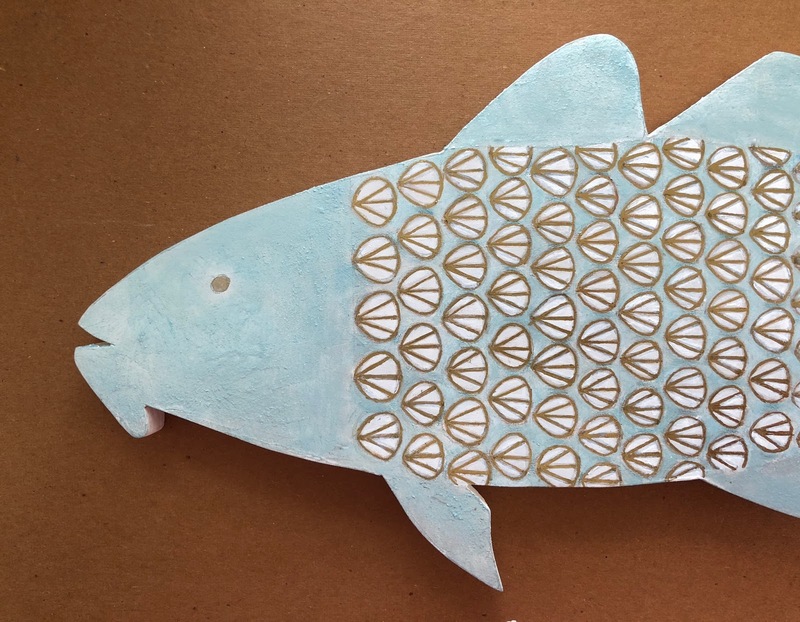 I am decorating a wooden codfish cutout as part of a fundraiser for Marblehead Festival of Art. About fifty area artists are decorating codfish, which will be displayed and then auctioned to raise money for the arts. This year, my codfish will have seashells where you would expect to see scales. 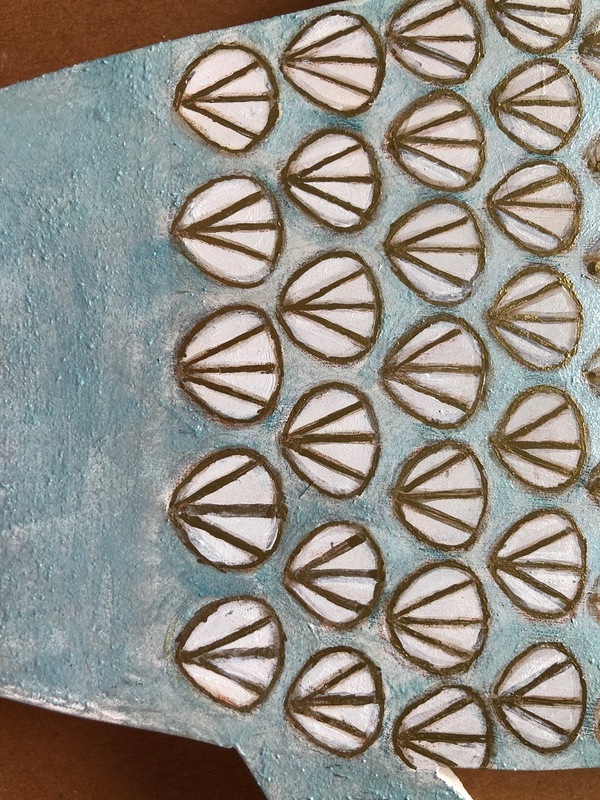 Today I finally started painting the blue background (between the shells), using two teeny tiny brushes. I am using iridescent pearl paint, mixed with manganese blue. The iridescent paint tends to clump, I think because it has tiny flecks of mica. So this is slow going, but I did manage to get a layer of blue down. I expect I will need to go over it again, at least in places. 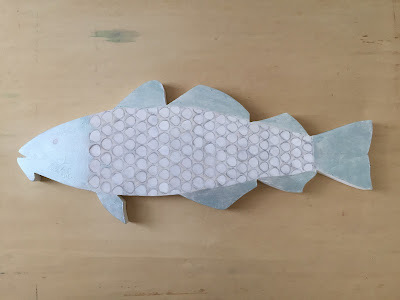 To be continued. . . .
Today I continued work on this wooden codfish that I am decorating for Marblehead Festival of Art. Some 50 local artists have been invited to decorate wooden cutouts; these will be auctioned off online to benefit the arts in Marblehead. 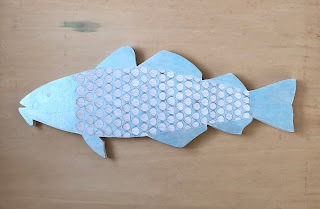 This year, I am decorating my fish with a seashell pattern (a kind of visual pun). Yesterday I painted the seashell shapes with white, fixing placement errors as I went along. Today I used colored pencil to refine the placement. I am outlining the shells in brown colored pencil, and will go over that with metallic gold marker. I am also using turquoise colored pencil to fill in the teeny tiny spaces that will be tricky to cover with a brush. The background will be the iridescent pale turquoise already on head, fins, and tail. I am eager to just jump in and paint the background, but first I am using white paint to clean up stray pencil marks (mistakes and smudges) that might show up through the paint. This is tedious, but as I learned last year, way easier than trying to clean up the mess that happens if you try to erase graphite pencil over gesso. With all of these small changes, the pattern of seashells is starting to emerge. To be continued. . . . Here is the project I have been working on, a wooden codfish I am decorating to be auctioned off in a fundraiser for Marblehead Festival of Art. This year, my fish will have a pattern of seashells where you would expect to see scales. Today I outlined the seashell shapes in light brown colored pencil. Later, the brown pencil lines will be covered with metallic gold marker. I also tried out a bit of turquoise colored pencil in narrow spaces where it may be hard to use a brush. To be continued. . . . 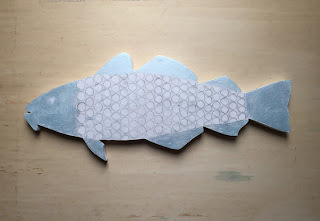 Here is Shelli, a codfish-in-progress. This is for the Marblehead Art Association, which will soon auction off wooden codfish cutouts decorated by local artists. My fish is going to be decorated with a seashell pattern, hence the name "Shelli". 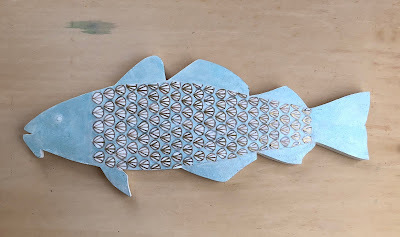 The iridescent blue will be the background color, continued through the middle of the fish. But right now I am using white paint for the seashells. To be continued. . . . This is the wooden codfish I am decorating for the Marblehead Festival of Arts fundraiser. This year I am painting a seashell design on my fish, and I have named this fish "Shelli". Yesterday I figured out the color scheme. I mixed some turquoise paint with iridescent pearl and I liked the color. I used the color to make a small sample of the pattern. But I had mixed up too much paint, so I decided to use it to start painting the wooden codfish. I was happy with the way the paint captures the light. To be continued. 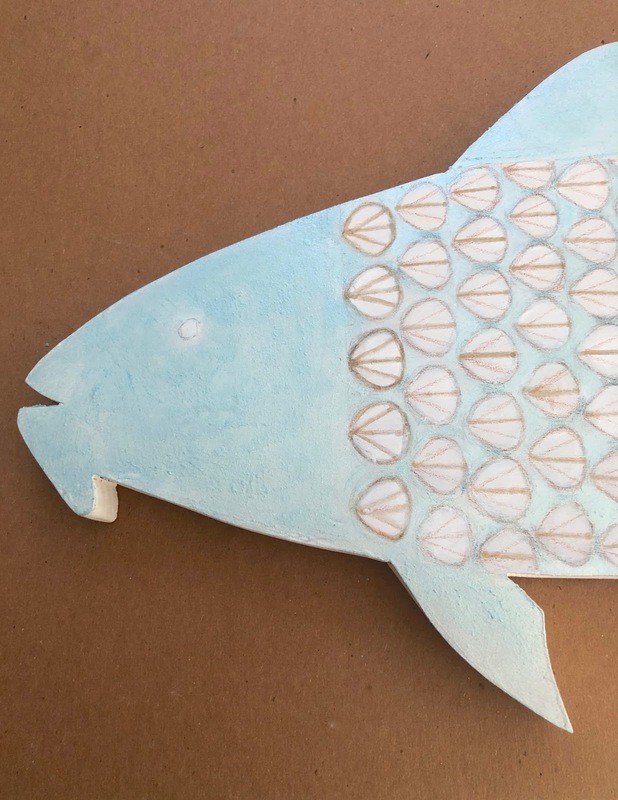 This year, I am decorating a wooden codfish for the Marblehead Festival of the arts. 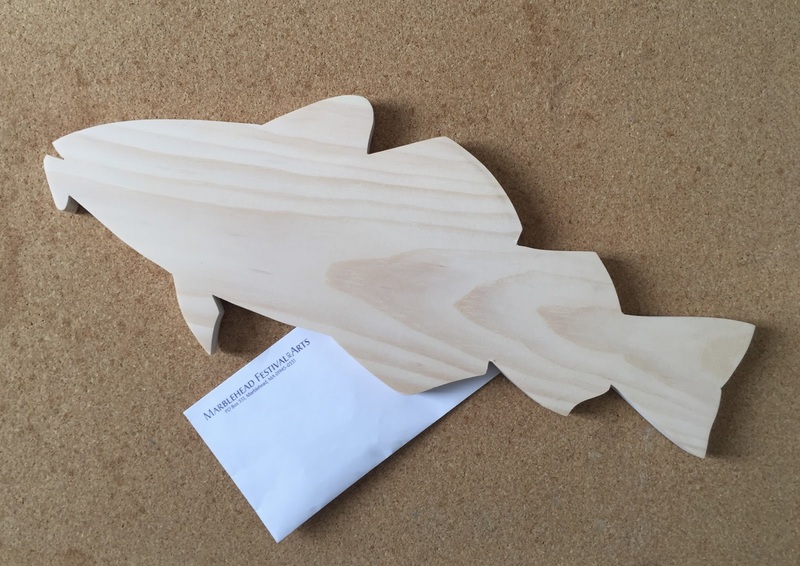 This is for a fundraiser in which local artists are given wooden codfish forms to decorate, and these are then auctioned to benefit the Marblehead Art Association. This year, I am going to decorate my fish with a seashell design (so the seashells replace the fish scales). My design is posted here (April 8) but I have been trying to decide on the color scheme. Yesterday I posted four possibilities and asked for feedback. Most people like the turquoise background, but a lot of people also liked the iridescent pearl background. Some people suggested blending the choices, which gave me an idea! I decided to mix up a pale turquoise iridescent paint to use as the background. I plan to have white shells, outlined in gold. This morning I tried out the idea. I mixed iridescent pearl paint with a bit of manganese blue, and really liked the result. So I made this little "mock-up". In fact, I mixed up too much of the pale turquoise paint but felt sufficiently certain of my decision to use the extra paint to start painting the fish. To be continued. . . . 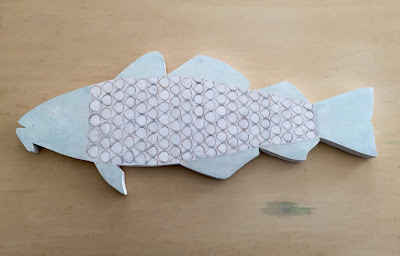 I am decorating a wooden codfish for the Marblehead Festival of the Arts. This is for a fundraiser in which local artists are given wooden codfish forms to decorate. The decorated codfish are shown and then auctioned to benefit the Marblehead Art Association. This year, I am going to decorate my fish with a seashell design (so the seashells replace the fish scales). My design is ready to go (posted here April 8), but I am still trying to figure out the color scheme. Today I tried out four possibilities. Feel free to vote in the comments. This is the painting I have been working on, and I finished it this morning. 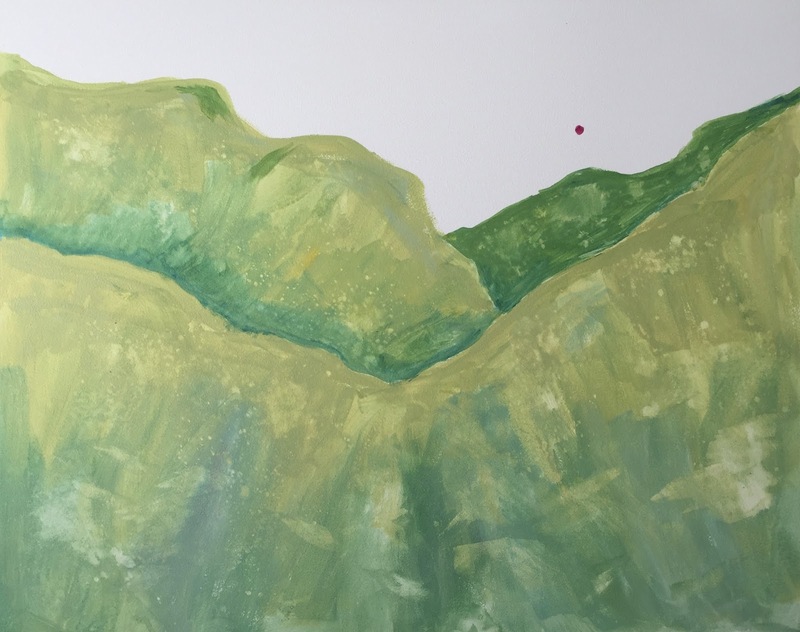 I added some pink outline to the top of the canyon, to indicate light and to suggest some three-dimensional shapes. Then I added a phalo-green wash to the cliffs, and as well as some more purple to indicate shadows. 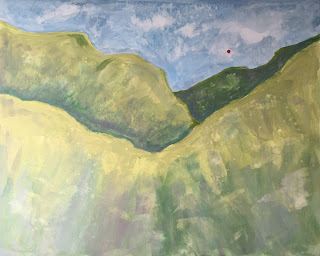 This is another of my "Mountain Daydreams," painted from my imagination and my memories of Colorado, my home state. This is acrylic used with water, on Aquabord, 16 x 2 inches. 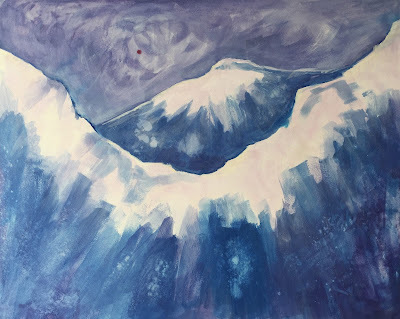 This is the painting I am working on, a mountain landscape painted from my imagination and my memories of the Colorado mountains. This is acrylic used with water on Aquabord, 16 x 20 inches. Today I used some transparent layers of very pale blue over the pink and blue areas of the sky. Now the distinction is still visible, but more subtle, and I am happy with that. I added more blue-green washes to the bottom of the painting, and also added some purple to create shadows, and to create a color tie-in between the sky and the mountains. And I brightened the sun a bit. Just a few more things to fix, almost there. To be continued. . . This is the painting I started a few days ago, This is acrylic paint used with water on Aquaboard. 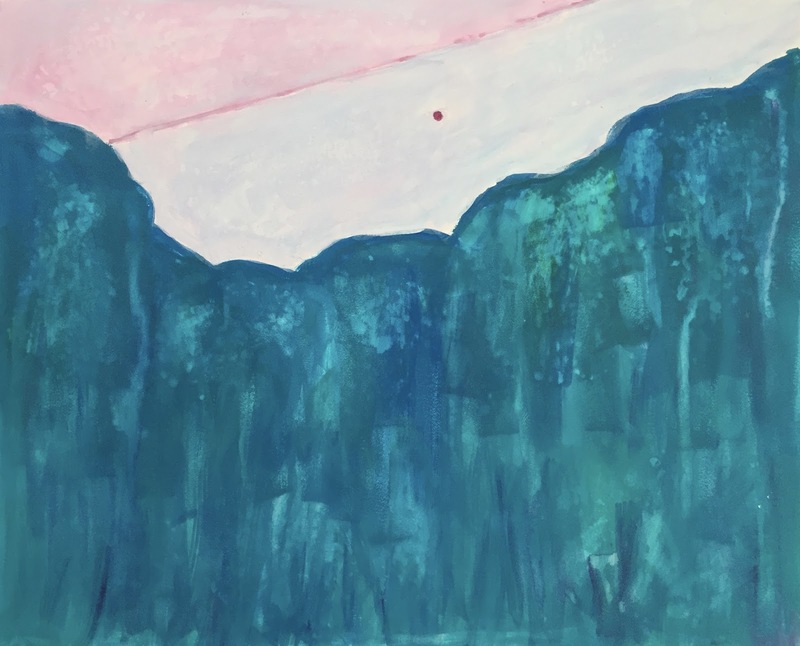 Yesterday I began working on the sky. The horizontal line is going to mark a layer of clouds rolling in (a storm front). I used pink and purple, but these are not the final colors. I want the contrast between the two colors to be more subtle, but still obvious. To be continued. . . I started a new painting this morning. 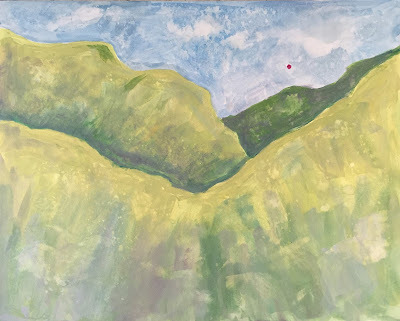 This is another of my "Mountain Daydreams," landscapes painted from my imagination and memories of the Colorado mountains. I am painting a lot of these landscapes for a show in July, and am trying to make it all around the color wheel. This is acrylic paint used with water on Aquabord. The straight line in the sky is a feature brought back from my earlier paintings. I imagine it is a jet trail, or perhaps the edge of a storm front. In this painting, I am letting the paint drip down over the image, something I haven't yet done the Aquabord for fear of accidentally staining the wooden sides (cradle). But today I figured out how to use dripping wet paint in a way that I can control. I am glad because that effect can suggest waterfalls, which is how I am using it in this painting. This is a work-in-progress. To be continued. . . . 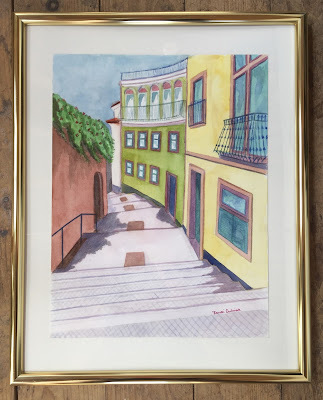 This is part of a series, "Watercolors of Portugal." I started this series after my first trip to Portugal; painting from my photos was a way of extending my visits. I have shown these paintings in a number of places locally, but for the past few years, this painting (a staircase in the Alfama, in Lisbon) has been sitting in a corner of my home studio because the glass had broken during transit. Last week, I finally took it in to get new glass, and picked it up today. Now it is hanging in my studio at Porter Mill. I am glad to have it there, because it is one of my favorites, and a reminder of a lovely trip. I thought that I must have already posted this painting here, along with other paintings in this set, but I searched and couldn't find it. So here it is, with brand new UV glass. This is the painting I have been working on. Today I added some white washes to the sky, and also added some pale yellow-green outline to the silhouettes of the hills. I made a slight change to the shape of one of the hills. And now I think it is done. This is acrylic used with water on Aquabord 16 x 20 inches. This is the painting I have been working on. This is acrylic used with water on Aquabord. Today I started by adding a pale mauve wash to the mountains, to tone down the yellow-green just a bit, trying to move it closer to the sage green colors I have seen in Colorado. Then I started working on the sky. This is still a work in progress. To be continued. . . . 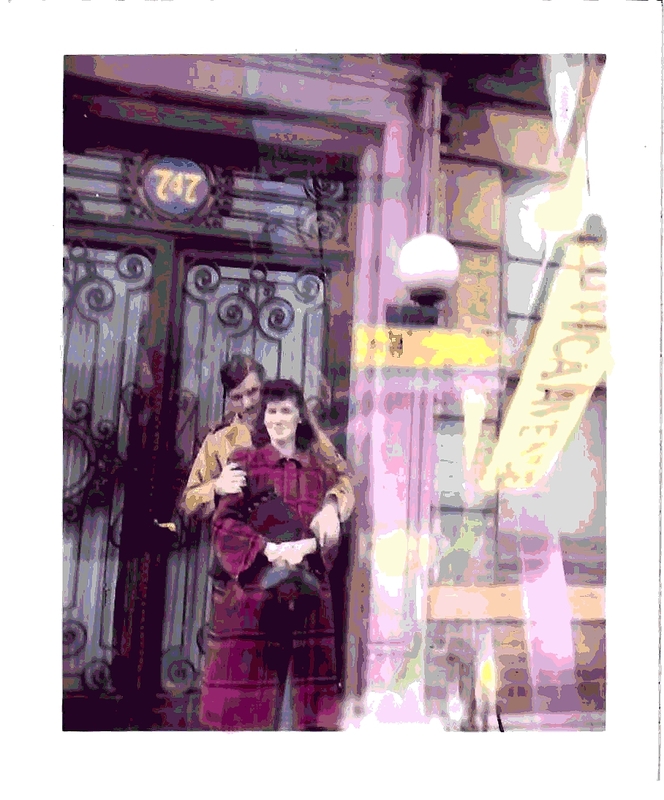 This is my favorite picture of my parents on their honeymoon, in New York City. The image began with a photo that I found, a double-exposed black and white snapshot, 2 x 3 inches. I first posted this back on April 4, 2005, and this is what I said: "I found this snapshot of my folks in my mother's old album today. They were married on April 4, 1943 and had time for a trip to New York before my dad left for his two years in Europe during the war. The double-exposed image looks almost like a collage, and intrigues me with its scraps of information. I decided to colorize it using Painter IX's digital watercolor. My folks used to play "Takin' a Chance on Love" on the piano, and I guess they really did take a chance, because they only knew each other for a few weeks before they got married." I was going to repost the original today, but the image was too small for today's standards, and was too blurry to post. So I opened the image in Painter and sharpened it a bit, and then used a combination of posterized and woodcut effect to make an image that would be clear at 300 dpi. So I am happy I managed to retain the colors and the basic look of the image. 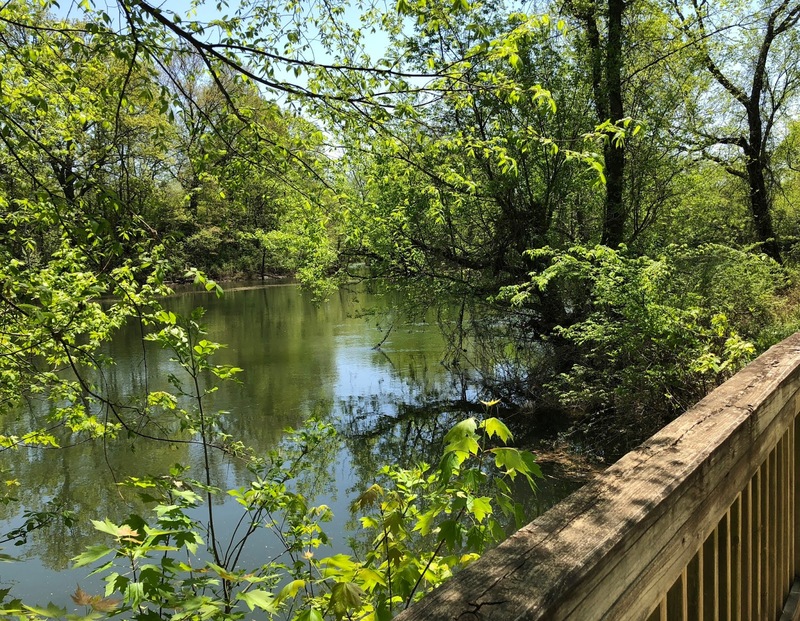 Sometimes you have to do a little work to keep those memories, but it is worth the effort. This is the painting I started yesterday. I am working from my imagination and my memories of Colorado. (This is part of a series that I call "Mountain Daydreams.) I am painting for a solo show this summer. 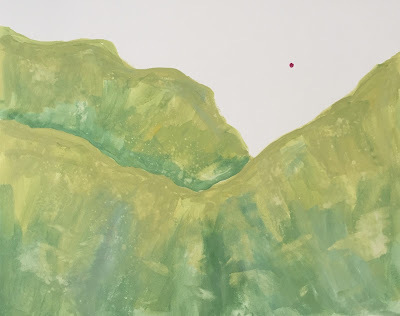 As I make my way around the color wheel, I want to be sure to include the soft sage greens of some of the vegetation on the Colorado foothills Today I decided to add a third hill in the background. I also added some green shadows to the other hills. To be continued. . . . I started another painting today, another landscape painted from my imagination and from my memories of Colorado. So many hills and mountains! But I am painting for a solo show in July. This is acrylic used as watermedia on Aquabord (16 x 20 inches). Just getting started here, so to be continued. . . . This is the painting I have been working on, and I finished it this morning. I used very pale yellow and very pale pink on the white areas, and then used a white wash over the sky and over the mountains. This is acrylic used with water, on Aquabord (16 x 20 inches).